Three people and one group will receive Manitoba's Human Rights Commitment Award next month, including Pride Winnipeg and Althea Guiboche, popularly known as the "Bannock Lady." 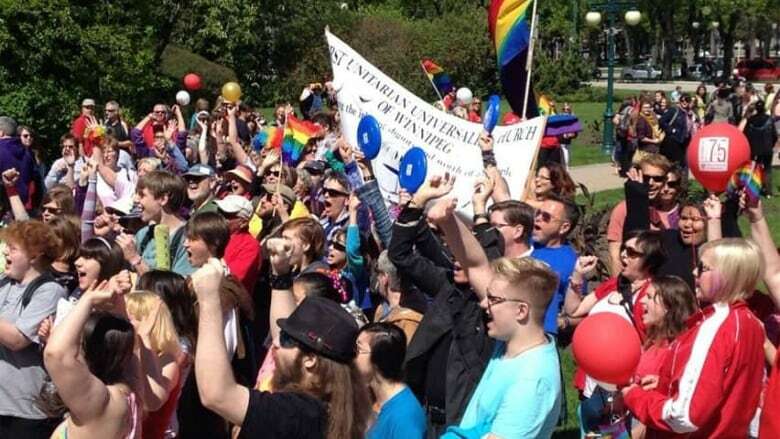 Tens of thousands of people attend the Winnipeg Pride parade and festival every summer. The Manitoba Association for Rights and Liberties, the Canadian Human Rights Commission and the Manitoba Human Rights Commission revealed this year's award winners on Thursday. The four recipients will be honoured on Dec. 9. Among the winners is Pride Winnipeg, which started out with a parade of 250 people on Aug. 2, 1987, and has grown over the years. This year's parade, a celebration of the province's lesbian, gay, bisexual, transgender, two-spirit, queer, questioning, intersex, pansexual, asexual, and ally (LGBTTQ*) community, hosted about 35,000 people and is one of the largest pride parades between Toronto and Vancouver. Guiboche is being recognized for her work in improving the lives of people on the street, in part by making and distributing bannock and other food every week. Also receiving a Human Rights Commitment Award is Rana Abdulla, a human-rights activist and pioneer for the rights of immigrants and refugees. Alana Robert, a Métis student at the University of Manitoba and a human-rights advocate, is being honoured with the 2014 Sybil Shack Human Rights Youth Award.